Thus far, the need for external devices to record HD footage has primarily been served by Focus Enhancements’ FireStore line. However, there has been growth in the segment recently and Datavideo has entered the fray with a unique design and price point under $500. Does the Datavideo DN-60 Solid State CF Card Recorder give the more expensive recorders a run for their money? Let’s find out. When you look at on-camera flash media recorders, there are really only two kinds: those made by the manufacturer to integrate with the camera, such as Sony’s HVR-MRC1 CF recorder, and third-party recorders that are designed to accept a standard cable and video format, and record it to the media inside. All the recorders vary in design dramatically, and the Datavideo DN-60 is no different. Front and center, sticking out like a nose, is the main controller knob that enables users to access almost all the device’s functions. A sliding door below that gives easy access to the compact flash card. Compact flash may seem like an interesting choice for a dedicated media recorder such as this. SD cards (SDHC, SDXC) seem to be the prevalent flash media of choice these days, and the data rate of HDV doesn’t tax the throughput of either card format. But compact flash has a few advantages, specifically when you start using larger cards. Foremost among these is the data rate with which you can read the card. According to Datavideo, the 400x card that came with the DN-60 to review can deliver nearly 60Mbps throughput. While faster SDXC cards are just starting to hit the streets, most SDHC cards currently top out at a theoretical 10Mbps for a Class 10 card. So once you record 16 or 32GB of footage, the CF card will dump all your footage into the computer many times faster. but I can see how that could easily be hit and damage the port in the DN-60. It also makes it a bit harder to put the recorder in a pouch or hang it from your belt. A top- or side-mounted port would have made a lot more sense. 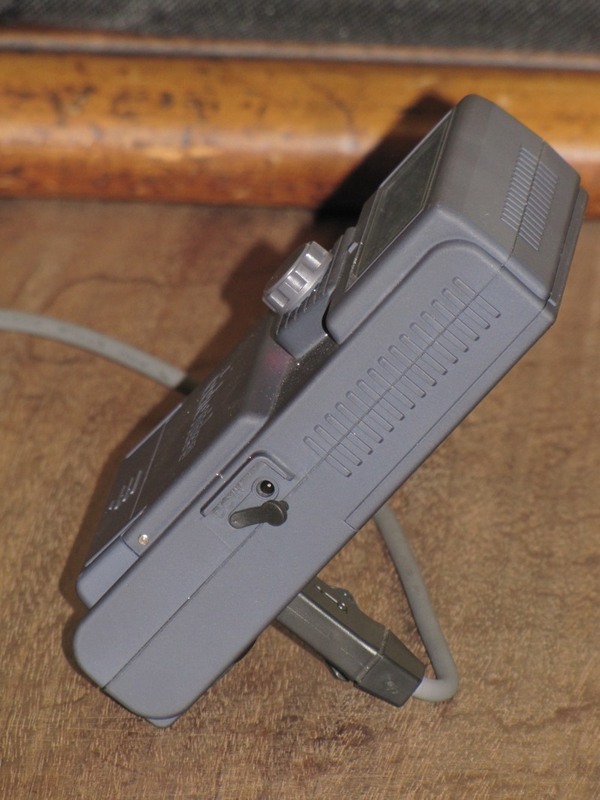 Also on the back is a 1/4″/20 thread to mount the DN-60 near the camcorder. It’s clear that the designers intended this to be attached to the camcorder, so the placement of the FireWire port would end up being in free space, not on a table or your body. The surface has a matte texture, which seems to be an increasing trend and, personally, I like it. It’s grippy and doesn’t show fingerprints. But I know from an Apple Newton I once owned that, after a while, the texture wears and you get shiny edges that belie a device’s age and wear. As I navigated back and forth through the menu, I couldn’t help but compare this handheld device with a small monochrome display to the original Blackberry devices, and I realized that a jog dial on the side would make it easier and faster to navigate through the menus, which are all up and down. It would also make the device a lot sleeker, and the knob would hopefully respond better. I’d also welcome a menu to keep the backlight on in a dark shooting environment too. We want to assess current status at a glance. It’s a pain to constantly have to go and rotate the knob to be able to read the display. Lastly, the back of the recorder has a large door for accessing the four AA batteries that power the recorder. This, again, is typical Datavideo—a clean departure from the industry norm of proprietary Lithium-ion batteries. Use any AAs you want. In a pinch, you can go anywhere and buy 4 alkalines that will give you a couple hours of record time. Save money (and the earth) and use rechargeable HiMH. Or, for really long run time, get a set of lithium AAs and get record longer times than anything other than AC. 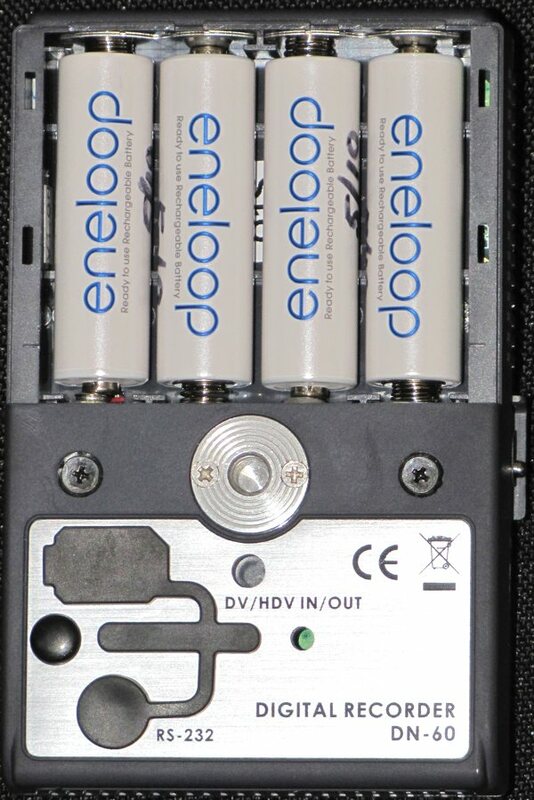 You can tell the DN-60 what type of batteries it has so that the battery indicator displays the different power curves of the different battery chemistries. The only down side of using AA batteries is that it takes a bit longer to change out the battery source than it would if, like Sony’s HVR-MRC1 or HVR-DR60, the DN-60 were designed to use the camcorder’s Lithium-ion battery as its power source. The HVR-DR60 promises 13 hours of run time with an NP-F970 lion battery. AAs aren’t bad, just slower, and with NiMH, a bit heavier than a lithium ion rechargeable would have been. The menu system gives you access to recording options, settings and everything that the DN-60 can do. There’s a STATUS menu that lets you quickly review, on four “pages,” the many settings of the recorder. There’s a SETUP menu that lets you set those settings. A TOOLS menu lets you create bins, change bins, format media, make media files, and update the firmware. A PLAY menu lets you select clips for playback back out of the FireWire cable. And lastly the RECORD menu executes recording. When recording, you get a display that gives you various continuous status indicators that show, for instance, folder, clip number, total record time possible on the card, battery level with four ticks, length of clip, and time code. There are two simultaneous numeric displays. Time code can follow the camcorder (to match tape), and length will tell you the duration of this particular shot (like a basic counter), both of which are handy. And as the counter counts up, the time left on the card counts down. I should mention here a couple caveats that I encountered. Jumping right in to recording and then going to access that footage on a computer left me scratching my head. I have a FireStore FS4 Pro HD and am used to getting immediate access to my clips. With the DN-60, no clips are visible on your media until you go into the TOOLS menu and “Make Media Files” out of them. And when I say no clips are visible, I mean that the computer told me the total empty space of the CF card and it was like there was nothing on it. Completely blank. This could cause confusion or problems in a fast-paced production where a card that does have precious clips on it, but hasn’t gone through that extra “Make Media Files” step, is handed off to a media wrangler who opens it up to see a completely empty CF card. Once I ran the Make Media Files utility, the video clips and bins were all there and worked perfectly. The second caveat I found was that the DN-60 cannot deal with both SD and HD clips on the same card. It has to reformat the card if you change settings. This makes it a bit harder, as I was doing, to shoot timelapse (SD-only) and HD footage. I sincerely hope there will be a firmware update soon that will eliminate this format restriction, and also to possibly enable HD timelapse recording (which I know is harder than DV because of the LongGOP issues with HDV). The simplest option is to use an older, smaller, slower CF card for timelapse recording. With regards to jumping back and forth, the DN-60 does actually let you create and save two user profiles. So I can keep my timelapse settings as USER #1 and my HD video settings as USER #2. HDV is recorded as M2T files only, unlike more expensive units that can rewrap it as QuickTime on the fly. But as more applications are becoming native M2T-capable, this will probably pose less of an issue in the future. The menu system currently lets you scroll past either end of the menu system, and has a few other minor issues that Datavideo techs say they are already working on. Nothing bad; they’re just making the user interface work better. 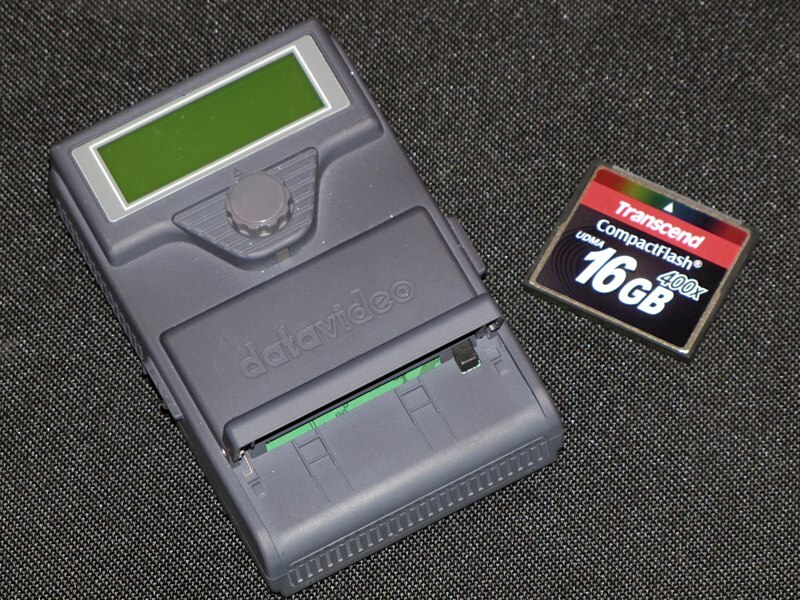 The DN-60 uses CF cards, but unlike most recorders out there, it gives you a choice between FAT32 formatting that forces long recordings to be chopped up into 1.99GB file sizes, and NTFS, which allows for single, long files, but is not supported by older operating systems. In reality, the DN-60 actually uses a different underlying file structure altogether. The underlying system was explained to me as a “transactional file system”: Every second, the system closes one transaction and opens a new one. This means that should there be a battery failure, a cable yanked out of the camera, or a power adapter unplugged, the most you can lose is 1 second of video. This is a big departure from using a computer system to record video where, if you don’t have a clean “end of file” written down, the entire file is unusable, even if you’ve been recording for hours. So the underlying file structure of the DN-60 is designed to provide robustness and peace of mind. Because of this, access to your footage requires a second step. When you finish recording, you have to go to the Tools menu and choose Make Media Files. Now, depending on which file system you picked in the DN-60’s menu, a single hour-long recording will be either be a series of 1.9GB clips in a FAT32 system, or a single long file recorded under NTFS. If you’re dealing with DV footage, you can just drop the individual or long clips into your timeline. If you’re dealing with HDV, your files will be M2T files. If your nonlinear editor supports it, you can either drop the individual 1.9GB clips into your timeline where (I am told) they will play back seamlessly, or you can drop the single long M2T file into your timeline, which will also play fine. A problem arises if your editing application does not like native M2T files. You’ll need to transcode the M2T files to some other codec for editing. If you have a single video recording broken among several 1.9GB clips on a FAT32 partition, the conversion utility may not properly see all of the HDV frames due to the break between the clips and the LongGOP nature of HDV. In my tests with MPEG Streamclip, I saw a loss of 13 frames. But the loss was based on the process—it was not an actual loss of footage. When I went back and reformatted the DN-60 as NTFS, and Made Media Files again, I could then load the single, long clip into MPEG Streamclip and the resulting file contained all the footage. So, you need to assess your needs and workflow when you try to decide whether the DN-60 is right for you. I used the DN-60 to shoot some timelapse footage over the course of two days and it looked beautiful (you can see the results at http://www.youtube.com/user/IEBAcommunications). I wish it could do this in HD, but for now it is an SD-only feature. So I set my HD camera into widescreen SD and let it roll for two days. This was my second attempt, as my first one involved different settings that did not provide the smooth slow motion I wanted. You can tell the DN-60 how many frames to record and how many seconds or minutes apart those frames should be. When shooting HDV, the manual states that the M2T files will have a bit of overlap that has to be trimmed, and that there may be flash frames. As I described in the Storage section, if your system can drop M2T clips into the timeline you likely won’t see any problems. If you have to transcode to use the files, you really ought to use NTFS and deal with single, long clips. Otherwise the clips won’t parse correctly and you may be missing frames. I never saw flash frames. When recording SD, you can scoot to the left in the Record menu and use the MARK function to chop a recording into a new clip. This is much better than stopping and starting (especially with tape, which wastes time) and would be perfect for recording multiple takes of the same shot, especially if you have a person that quickly restarts themselves, or you just want to quietly split the takes into separate files without a whole lot of attention. When recording HD, this feature isn’t available, again probably because of the LongGOP structure of the MPEG-2 HDV stream. The nearest competitors to the sub-$500 DN-60 are priced around $750. First is the CitiDISK, which I reviewed in April 2006. It is a competent hard drive recorder, but it lacks any sort of status display to help you when things don’t go perfectly. Next is Sony’s HVR-MRC1 which interfaces well with some Sony camcorders, but is an add-on just like the DN-60 to everything else. The DN-60 offers a few more features, like a much more customizable timelapse mode, and a more informative display, but navigation and execution are better on the Sony, plus it uses Sony Lithium-ion batteries. So weigh that into your decision. Approaching $800 you get to the FireStore FS-H200, which offers a vastly improved color LCD screen, letting you navigate your clips with certainty. It’s designed to record video footage into many more formats: QuickTime and M2T for HDV and Raw DV, AVI Type 1, AVI Type 2, Matrox AVI, and Canopus AVI for DV. If you need to wrap HDV into QuickTime, this is important because neither of the less expensive models do this. But even with the FireStore, the timelapse function is DV-only. Maxell has entered the fray with their iVDR system. 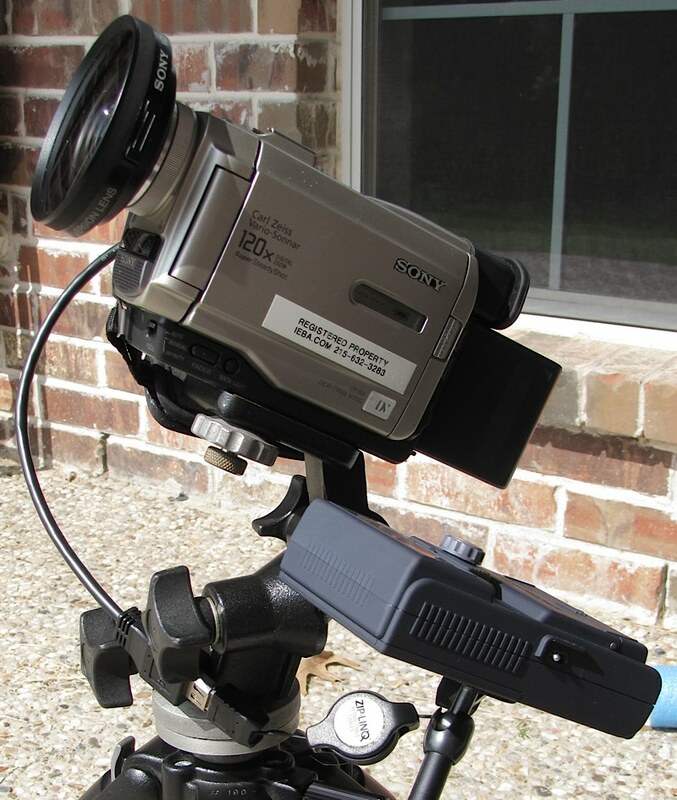 A dockable media package connects to a camera I/O box with FireWire connections to your camcorder. Two media packages are currently available: a 250GB HDD and a 500GB HDD. Both offer internal USB connection to the computer, but an optional external interface offers FW-800 for increased speeds. The recorder has an MSRP in the same $800 range, but it ends up being a bit pricier than all the other single-box systems by the time you add all the pieces together. However, no other on-camera system offers swappable, ruggedized hard drives. I will be testing this system in the coming weeks and look forward to relating how well it works in actual use. Subscribe to the RSS feed for this site, or use the e-mail subscription in the upper right corner to make sure you don’t miss a detailed review. Continuing up the scale are a few larger-sized CitiDISK hard drive recorders. At about $1,000, the FireStore FS-H200 Pro comes in offering several notable features: video playback on the unit’s color LCD, MPEG-4 proxy generation, MXF HDV support (for Avid users), and the ability to dynamically log metadata wirelessly during recording. The DN-60 is rather diminuitive. Do you need the extra features? Or do you just want to get your HDV or DV camcorder recording to flash media? I’ve had people contact me specifically about the ability to record to hard drive or flash media. Today’s producers who need to deliver content quickly do not want the additional tape digitization step of the production process. Not to mention the fact that decks, though rentable on an as needed basis, are an additional cost and step that can be avoided with direct hard drive or flash media recording. The DN-60 gets you there without a lot of bells and whistles, or the cost associated with them. This article originally appeared in EventDV magazine, for which I am a contributing editor. Datavideo provided the DN-60 for my review at their expense. I was not compensated for the review. The DN-60 was returned to Datavideo at the end of the review. There is no connection between Datavideo and myself. See my Review Policy for more information. I have a Sony HDR FX1E and I’m in doubt about datavideo DN-60… Any advice?